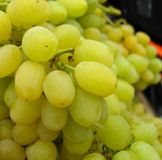 Grapes may be one of the earliest cultivated fruits on Earth. The Greeks harvested the berry for wine-making and the Romans later perfected the practice, understanding the importance of pruning, climate, and proper storage. After a short disappearance, the European Church revived the practice of wine-making and Franciscan Friars later brought the grape to California, where the soil and lack of grape-feeding pests provided an ideal growing environment. There are three main species of grape (European, North American, and French Hybrids) and thousands of varieties. According to the Food and Agriculture Organization, approximately 71% of world grape production is used for wine, 27% as fresh fruit, and 2% as dried fruit. They grow in clusters of 6 to 300 and are considered a “true berry.” They are a versatile ingredient and pair well with savory dishes, like a traditional chicken salad or as an adventurous topping for fish.